The Nissan Micra has historically had an image problem. It has been loved dearly by owners but it has never had a mass market appeal. 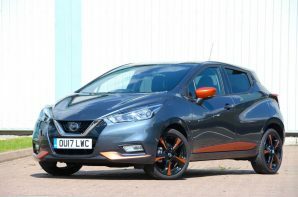 A large part of the problem has been a reluctance to target development towards European tastes, but it appears that Nissan has turned a corner with the latest version which is unrecognisable from earlier offerings. We have to say that we approve of the new design philosophy. It still has a distinctly Japanese flavour but it is also far more confident and much more interesting to look at. The hidden rear door handles work well and the origami-esque line that runs from the headlights to the tail lights adds visual appeal and dynamism to the previously nondescript side profile. The good news continues inside with a dashboard which is both well laid out and easy to use thanks to the combination of a large central touchscreen alongside the retention of analogue dial controls for the stuff you use the most often like the heater/AC controls. Material quality is improved too with more soft touch materials on show and you can specify coloured sections which adds a bit of character. There is much to like, but we can’t quite figure out why Nissan’s excellent birds eye-view camera system can only be specified on high spec Micra. It is the best parking camera system by far and is surely a perfect fit with a car likely to spend much of its life in the urban environment. Of course style is one thing but the Micra has always failed to deliver substance too. Once again things are much better this time, with a clever brake based system which reduces pitching movements over bumps and a good chassis it strikes a decent balance between ride and handling. It can’t match the class leading Fiesta for fun but it doesn’t disgrace itself either. With 300 litres of boot space, attractive and confident styling, decent refinement and bags of personalisation options the Micra is now a credible Supermini.